Are you a busy blogger? Looking for new, unique tools to help you work smarter? 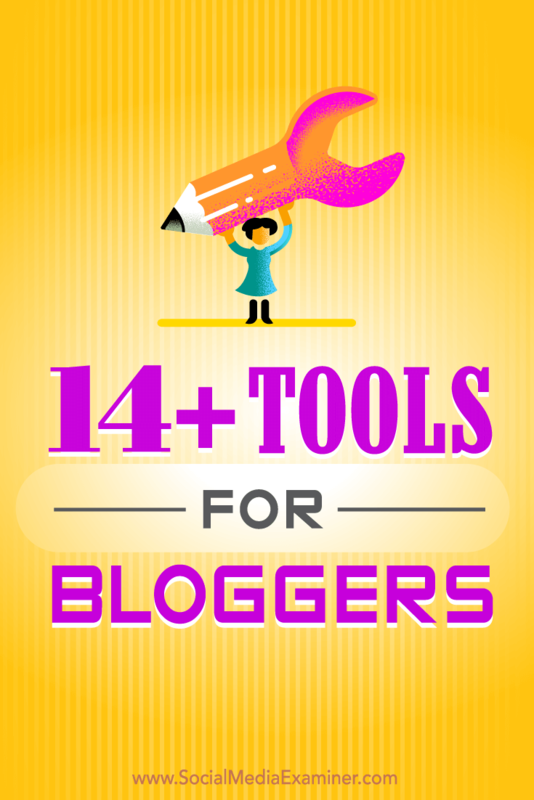 The right tools will help streamline and improve your blogging. In this article, you’ll discover more than 14 tools to help bloggers quickly, efficiently perform common tasks. 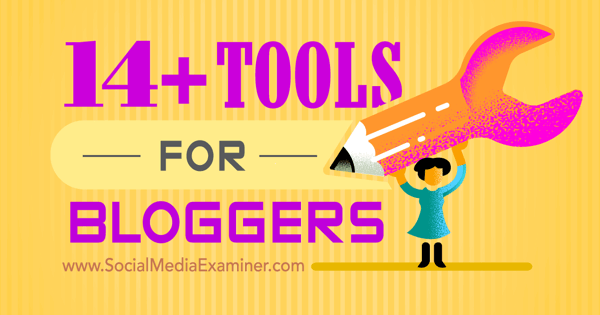 Discover tools bloggers can use to streamline tasks. A picture is worth a thousand words. You want them to be the right ones. Unsplash and Foter help tell your story. 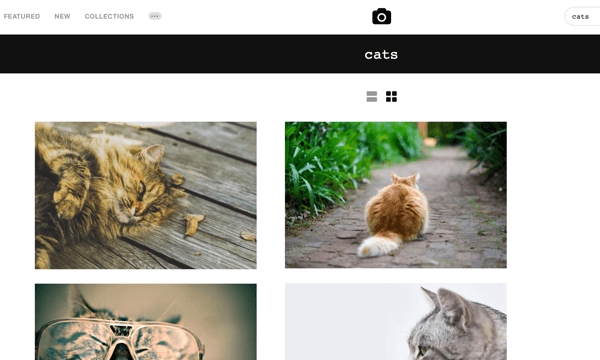 With Unsplash you get access to a bank of 50,000+ free-to-use photos. No attribution is required. Use Unsplash to source free, high-resolution professional Creative Commons images. If there’s nothing suitable on Unsplash, Foter allows you to choose from a whopping 229 million images. Here’s how: type in the search term and click Commercial Use. Next, click on your image. Then download whatever size image you want. Finally, cut and paste the picture attribution into your post. Foter’s scale and ease of attribution are both phenomenal. It’s a massive time-saver. The load speed of a page is a key ranking factor. Images are usually to blame for lengthy page loading times. That’s where Compressor.io comes in. 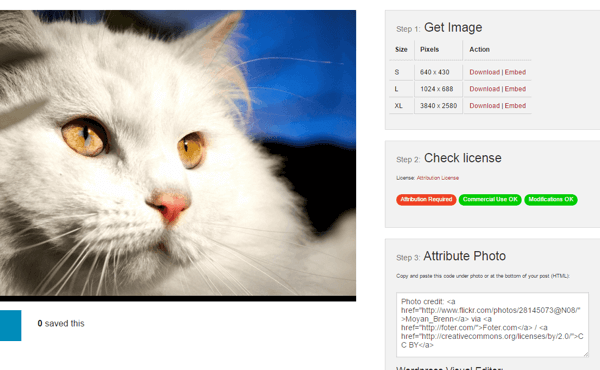 It will reduce image sizes by up to 90%, with no loss of quality. Here’s how: just drag and drop your image, watch it compress before your eyes, and then download it. 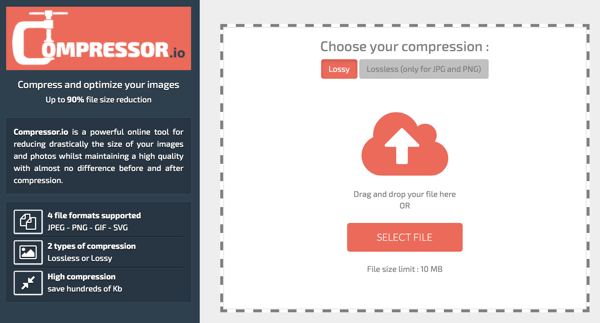 It only takes an instant to compress bloated images with Compressor.io. 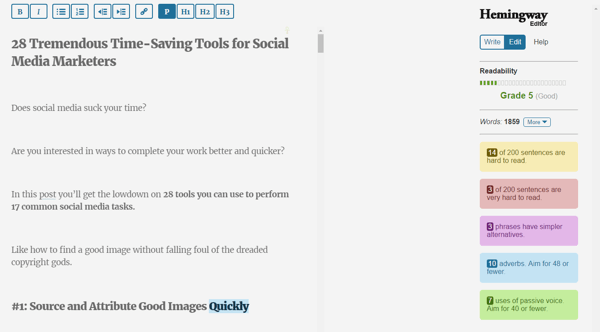 If you write a lot of blog posts you’ll need a reliable screenshot grabber to gather illustrative images. 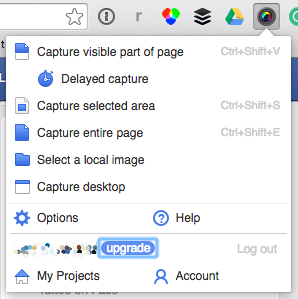 To save time, install Save to Google Drive and Awesome Screenshot. Save to Google Drive is a super-speedy browser extension that helps you save web pages. Click the Google Drive icon in your browser extensions bar and it saves the entire web page to your Google Drive in seconds. Alternatively, use Awesome Screenshot if you want to crop the page or annotate it. Click on the Awesome Screenshot extension and you’ll get a drop-down where you can choose your options. Awesome Screenshot is an excellent, easy-to-use browser extension. When you’re done, save and store your screenshots in Awesome Screenshot and you can access them from anywhere. When you’re competing for a target audience, it’s helpful to find out where a competitor’s traffic comes from, what their referral sources are, or what their top organic and paid keywords are. 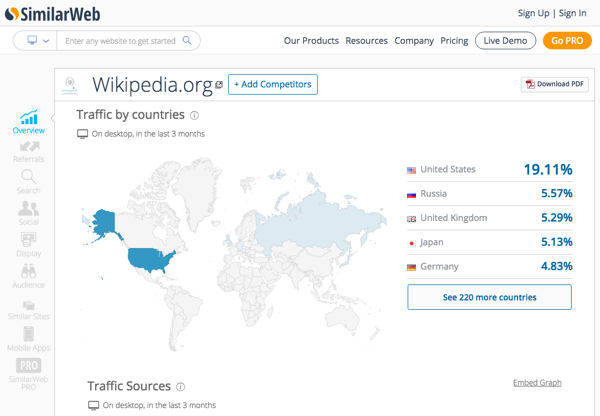 SimilarWeb is an unbelievable resource that can help you find this information. Discover where your competitor’s traffic comes from. The browser extension works best, but you can get the same stats from the SimilarWeb website, too. Want to do a basic SEO audit on your blog, but don’t know where to start? Screaming Frog SEO Spider Tool, a small desktop program that acts as a website crawler, will check your blog for broken links, title tags, duplicate pages, redirects, the length of all your meta descriptions, and more. 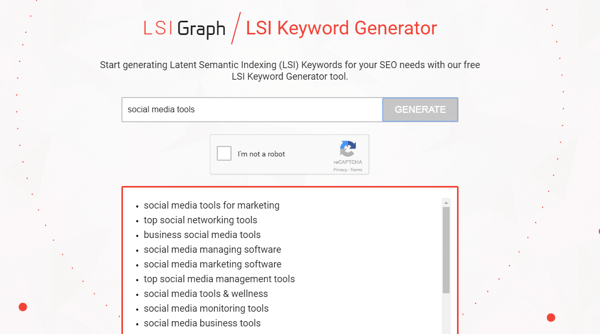 What’s My SERP is a free tool that will track up to 25 keyword phrases across 20 domains for you and up to three competitors. You can even export the data after each report. Just sign up, input your keyword phrases, and click Check All Keywords. The tool even tracks three of your competitors for the same keywords too. If you want enhanced features, try the multi-functional Monitor Backlinks. Its keyword ranking tool monitors up to 500 keywords, as well as those of your competitors. Yoast SEO is a WordPress plugin that makes it easier for bloggers to optimize blog posts to rank on Google. Simply fill in the fields and tweak your entries until you get a green traffic light. A useful feature for bloggers who use social media is the ability to set the title, description, and featured image for shares to top social networks. 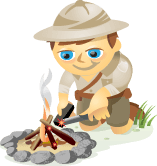 Yoast SEO allows you to tailor snippets for various social networks. Are you doing influencer outreach? Do you pitch to journalists? This tool will find anyone’s email address. 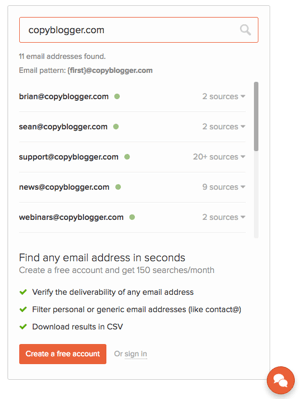 Email Hunter offers 150 searches with the free plan. For most people, that’s plenty. Type in the domain name of the company the person you want to contact works for. If a specific email address isn’t located, Email Hunter will give you enough information to make an educated guess. Each month you’ll get 150 free searches without choosing a pricing plan. This is one of those tools you never knew you needed until you have it. Rapportive, a Gmail and Firefox add-on, will help you find out who a person is, what he or she does, whom you know in common, and where the person is based. You can even send connection requests, all of which can be accomplished without leaving Gmail. Rapportive is a great tool for growing your LinkedIn following. And if you like Rapportive, you’ll love Clearbit Connect. This handy extension will show you even more information about your contacts. Easily see who sent the email you’re viewing, what company he or she works for, the person’s social handles, and more. Whether someone clicks through to your content depends how good your headline is. It’s 80% of the battle. Luckily, there are three useful tools to help you. 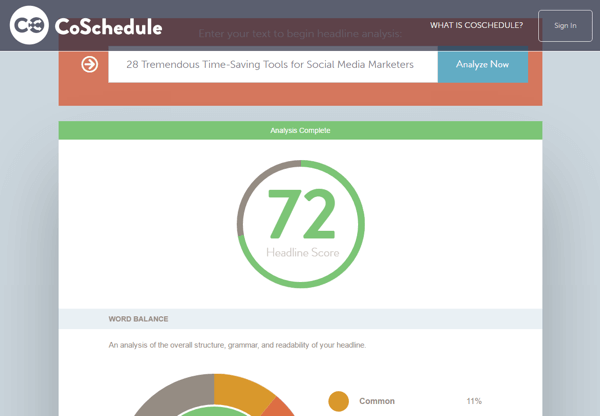 Type your headline in CoSchedule Headline Analyzer and you’ll get a rating of 1 to 100. Anything over 60 is good, headlines between 70 and 80 are considered great, and a score of more than 80 is considered stellar. But what about feelings? 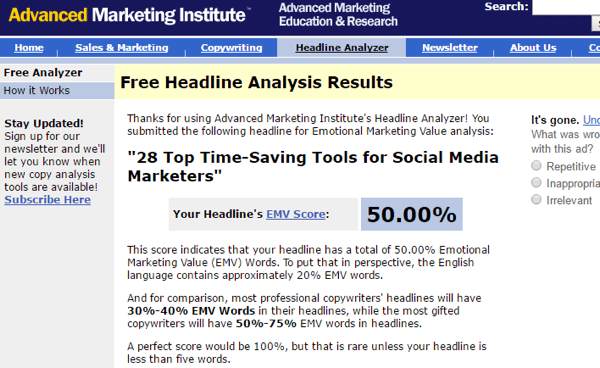 The Emotional Marketing Value Headline Analyzer will rate your headline’s emotional appeal. The sweet spot is 30% to 40%, and anything above that is great. The headline on this post has emotional appeal. And if you can’t come up with a headline, SumoMe offers the Kickass Headline Generator. Enter a topic to get a suggested headline based on that topic, which is useful when you’re looking for inspiration. So you’ve set your blog up right and you’re producing great content, but your email list is growing slower than a bonsai tree. Who you gonna call? SumoMe, that’s who. You’ll get a cost-effective straight-out-of-the-box list-building option. 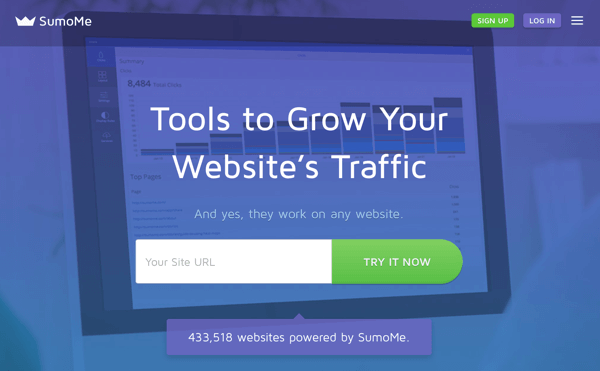 SumoMe is a WordPress plugin, but it works on any website. You’ll receive a welcome mat, scroll box, scroll bar, smart bar, and list builder. Small business social media marketers should give this a whirl. And if you want to grow your list through giveaways and gated content, you can check out Thrive Landing Pages, Thrive Leads, or Leadpages. Google is always evolving, and semantic search is where it’s at. Whenever you write a blog post, always have a keyword phrase and a topic in the back of your mind. When you’re done with the post, pop over to LSIGraph or Answer the Public to see what terms are linked semantically to your topic and phrase. If any of the terms you see in the results fit naturally in the piece and enhance it, include them in your post. LSI is a rich source of synonyms and related phrases. Remember when you had to stick everything into Word to do a spell check? Grammarly can help with that. Add it to your browser and it will seamlessly check your grammar and spelling, whether you’re typing in Gmail, on Facebook, in Word, and more. 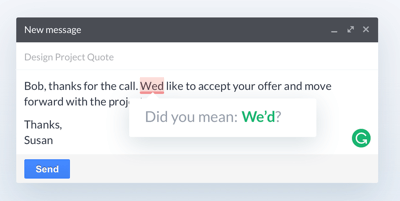 Wherever you go online, Grammarly has your back. If you struggle with writing, Hemingway can help. Even if you’re a good writer, Hemingway will raise your game by helping you cut passive voice, shorten sentences, and make your copy easier to read. How this post rated (before the edit). Whether you’re a small business starting out on your marketing journey or a seasoned pro looking for a few useful hacks, each of these tools will help streamline and improve your social media marketing. What do you think? What are your top three social media marketing tools? Please share them in the comments. Tips on tools you can use to work smarter and more effectively on your blog. David is a United-Nations-award-winning digital public relations specialist. Founder of Zude PR, he helps SMBs across the UK and Europe ace their digital marketing. Lover of SEO and marathoning.